If you are on the hunt for savory squash recipes, you came to the right place. 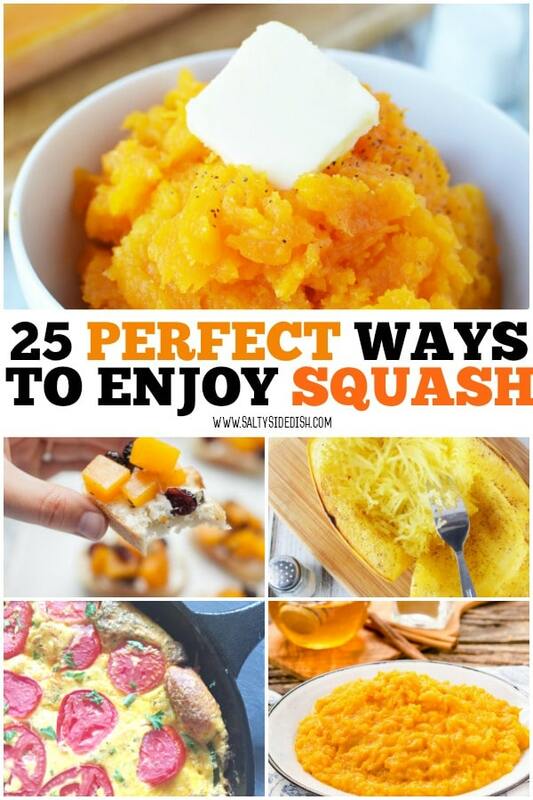 I have gathered a ton of squash recipes to add to your menu. From butternut squash, spaghetti squash, and summer squash, these recipes will keep you going all year long. Personally I am big on the side dishes, but lets not throw out that veggies also make great main dishes too. I love cooking with squash because it is so versatile and can be used in so many ways and give you delightful dishes the whole family can get behind. But making squash is so much more than learning how to cook spaghetti squash in the oven. Here are some of my favorites (and soon to be yours) below! Spaghetti Squash Boats | Salty Side Dish: Appetizer, Side Dish or Main Dish, doesn’t matter cause this dish is one you will want to DISH UP every night. Mexican Squash Hash Browns| Strength And Sunshine: Start your day off right with this hearty Mexican inspired spaghetti squash hash browns. Spaghetti Squash Shrimp Primavera| My Life Cookbook: So healthy and delicious! The combination of the squash and shrimp takes it to a whole new level of amazing! Instant Pot Chicken Marsala With Spaghetti Squash| Mama Instincts: This is a simple meal that has tons of flavor and is healthy too! You are going to love it. Instant Pot Spaghetti Squash Pad Thai| Awe Filled Homemaker: Juicy chicken and spaghetti squash are the out flavors in this yummy recipe. Your taste buds are going to love it! Instant Pot Spaghetti Squash with Meat Sauce| Reuse Grow Enjoy: Mouthwatering meat sauce with spaghetti squash is sure to fill you up! This is so good! Squash Hash Browns| Forest & Fauna: These hash browns simply amazing! They taste great and have that perfect crispiness to them. Crock-Pot Parmesan Spaghetti Squash| Crock Pot Ladies: An easy way to cook your spaghetti squash to perfection and top with a tomato based sauce and of course parmesan cheese. Roasted Butternut Squash | Salty Side Dish: Gone are the “eat your vegetables’ statements you have to throw at your kids because this roasted squash is already gone! Instant Pot Turkey Chili With Butternut Squash| Art From My Table: You will be impressed by this easy and filling dish! It’s a crowd pleaser that you can’t get enough of. 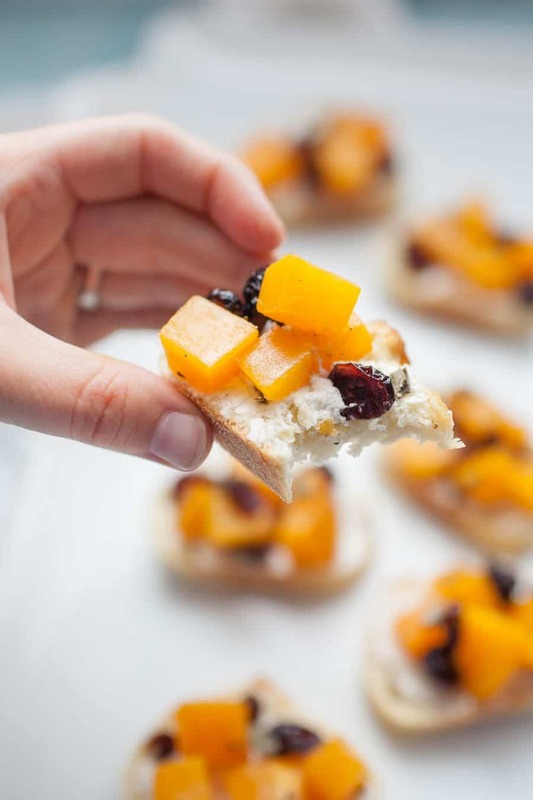 Cranberry Goat Cheese Butternut Squash Toast| A Joyfully Mad Kitchen: A creative dish that has the perfect pairing of cranberries and squash. Your friends will rave about this! Butternut Squash And Sausage| The Happier Homemaker: Italian sausage, butternut squash, minced garlic, chicken broth, white wine, penne pasta and parmesan cheese create a fantastic dish that will a fantastic right up! Butternut Squash Mac And Cheese| Living Sweet Moments: Fun twist on traditional macaroni and cheese that even the pickiest of eaters will love. You have to try this fantastic recipe. Pressure Cooker Honey Ginger Butternut Squash| Magnolia Days: Warm spices and flavors paired with the creamy texture make this side dish that is decadent, and a must make any time of the year. Butternut Squash and Apple Soup | The Mama Maven: If you love butternut squash soup, try out this recipe, it adds a new level of flavors from the apple. They pair perfectly together and give you that hint of sweet. Instant Pot Beef And Squash Stew| Craft Create Cook: Butternut squash, diced onions, minced garlic, carrots, juicy stew meat, seasonings, and broth combine to make a delicious stew! Butternut Squash Soup| The Midlife Mamas: This soup is perfect for a cold day to warm up or for a light lunch. Pair with a beautiful garden salad and some fresh bread. Slow Cooker Butternut Squash Soup| Lynzy & Co.: Guests will be impressed with this fantastic soup. This can be the main course or a side dish. Either way, it’s fantastic! Butternut Squash Winter Rice Pilaf| A Joyfully Mad Kitchen: You will want to make a double batch of this mouthwatering recipe. The subtle sweetness and savory flavors are out of this world. Slow Cooker Butternut Squash And Parsnip Soup| Kenarry: This soup gives you that creamy butternut squash texture you know well, and the parsnip adds such an amazing element of flavor to this soup. Great for workday lunches, just heat and eat. Garden Skillet Supper| Southern Plate: A simple meal that you can cook in no time at all! This is perfect for feeding a crowd. Add a fresh salad and you are set. Summer Squash Parmesan Pasta + Turkey Meatballs| Mashup Mom: This pasta dish is extra rewarding. I love pasta paired with squash it goes well and the leftovers are just as good. Crock-Pot Ratatouille| Crock Pot Ladies: Gather up your garden veggies and create a hearty Ratatouille in your crockpot. Yellow squash, zucchini, eggplant, and more for one flavorful veggie dish. Cheesy Zucchini Squash Au Gratin Bake Recipe| iSaveA2Z: This hearty dish is a perfect side dish or even a main to serve up and fits the keto diet plan! Crock-Pot Creamy Chicken And Summer Squash| Crock-Pot Ladies: Grab some summer squash fresh out of your garden and make this savory chicken crock pot dish. Hearty, filling, and oh so satisfying. Summer Squash + Tomato Frittata | Mashup Mom: Low carb dish that is great to serve up for a light lunch or even brunch. You have the bursting vegetable flavor with a nice egg and cheese background of flavor. 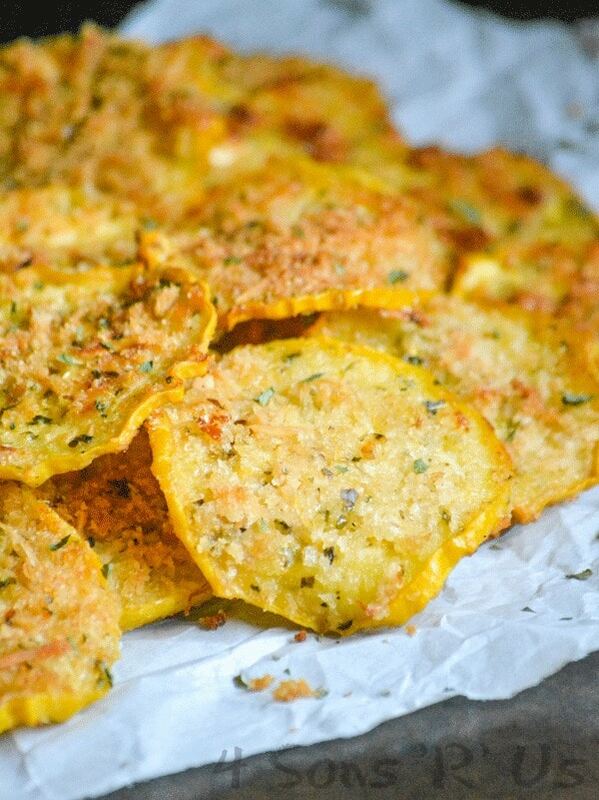 Squash Chips| 4 Sons R Us: These garlic Parmesan squash chips are great to serve up at your summer barbecues or eat as a snack that gives you that crunch your craving.